Enough time has passed where I feel like I can finally talk about the day Annabel was born. Every time I’ve tried to write about it I haven’t been able to find the words, or the emotions were too overwhelming to work through. But I fear as more time passes I will forget things, and I don’t want that either. As Mike said, we went in to Labor and Delivery that day because I wasn’t feeling right. It wasn’t anything in particular but a collection of symptoms: a sudden and awful headache, belly tenderness, decreased fetal movement, and just a general unease in my head that I needed to be seen by a doctor. When we arrived at the hospital we were whisked away into a room and tended to immediately. Mike was really certain that we were going to be there for a couple hours and then be sent home. I was less certain but didn’t want to jinx anything either way. Everything kicked into high-gear at that point. I called my parents, my cousin, my brother. I tried to send texts to all my friends, but the c-section prep made it impossible. My amazing nurse Helen inserted my IV, did a blood draw, and asked me 1,001 questions while Mike gave me this weird wipe down with sterile wipes. The wipes were FREEZING. Helen checked my blood sugar and it was really low, so she gave me a bag of cold fluid via my new IV. Between the fluids, the wipes, and my nerves, I was shaking badly. And then things got funny. I started to feel nauseous, so I told Helen as much thinking she could put something in my IV to help with that. She told me to sit back and take some deep breaths. Not hard to do since I was, you know, already laying in bed. This is where things get fuzzy. I THOUGHT I said to Helen that I felt like I was going to pass out, but Mike and my cousin Leah (who had arrived by then) said I didn’t. According to everyone else, I was unresponsive and making guttural noises. The crazier thing is that I don’t remember passing out. I have fainted plenty of times and I remember losing consciousness, but not this time. I have some fuzziness, but as far as I remember, I said I was going to pass out and then I was OK. But, no. Thinking back now, I realize that the room was jammed with people. I remember hearing the doctors and nurses saying my blood pressure (70/40) and that the baby’s heart rate was decreasing. I remember seeing the frightened faces of Mike and Leah, the serious faces of the medical staff, and trying to assure the anesthesiologist that “I’m a fainter, it’s noooooo big deal” while he looking at me like I was a little bit crazy. The decision was made to move me to the operating room immediately in case I lost consciousness again. In there, the anesthesiologist told me that he wanted to put me under general anesthesia for my c-section. That meant I’d be sleeping and Mike wouldn’t be allowed in the operating room. His reasoning was that he was worried I’d pass out again and he didn’t want to wait to get the results of my blood tests – blood tests that would indicate the safety of being awake for the surgery. Mike and I had always known this was a possibility, but when it was presented to me I looked at Dr. Risky and pleaded with her not to let it happen. If I needed to be put under for the surgery, that was one thing, but if there was a possibility I didn’t, I really wanted to wait and see. She agreed, not only for our sake, but also because general anesthesia complicates things. Luckily, the blood work came back in my favor, and I was allowed to be awake. I had a lot of time on the operating table while I waited for things to be determined – time where I was alone, since Mike wasn’t brought into the room until moments before the surgery began. I tried to stay calm – Annie’s heart rate was extremely elevated because of the drugs they’d given me when I’d passed out – so I knew I had to keep mine under control to not make things worse. While I laid there, I was greeted with a friendly face. My friend Staci, a nurse and one of my sorority sisters from college, received a text from my cousin telling her I was going into surgery. She hightailed it down to the hospital and made it in time to be there. I was so happy to see her smiling eyes behind her surgical mask. I can’t tell you how much calmer I felt knowing she was there. The surgery went off without a hitch, and soon the anesthesiologist was telling Mike to stand up and watch our baby be born. I felt all the tugging and pressure, and then a lightness. There was a commotion from all the people in the room, and then I heard a tiny but powerful sound – Annabel’s cry announcing she was here. She sounded exactly like her sister the day she was born. There is nothing – nothing – like hearing your child’s cry, because that means they can breathe. Memories from Madeline’s birth came flooding back, and I realized I was crying. I badly wanted to see my baby, to touch her, and confirm that she was here and she was OK. When Staci brought her over to me, it was magical. That first touch was so amazing. Even now, 27 days later, I am having a hard time writing more than the blow by blow of the day. I want Annabel to know how great a day it was. I had been so scared that the emotions would be overwhelming, but they weren’t. I was scared I would be overcome with sadness, but I wasn’t. Not that day. The day of her birth was just joy and love and happiness. The staff at the hospital took such amazing care of all of us. They knew about Madeline, and they wanted to hear about her while they met Annabel. They made an effort to include Maddie in the day and it meant so much to me. At the hospital, we enjoyed the newness of our daughter. We reveled in her birth and specialness. At home, we continue to do so. Someday, I’ll find the words to express just how special she is. Darling, darling girl. So loved, and so lucky to have parents so amazing and so unafraid to tell you just how much they love you. Heather, I’m in awe of you. .-= Kate @ UpsideBackwards´s last blog ..Big boy bed =-. You are both absolutely gorgeous! .-= Sara @TomTheGirl´s last blog ..Puppies! =-. .-= Lynn from For Love or Funny´s last blog ..When being right is wrong… =-. Thank you for sharind this beautiful birth story! And gosh you guys make some beautiful girls!! The day of her birth was just joy and love and happiness. I am so happy to read this… it’s what a day of birth should be, bad things happen, but we tend to forget, and in de end, a baby coming in the world should just be joy and love and happiness… Glad that Annie was OK and you guys were all good. A happy ending to the day before an even happier beginning… The beginning of Annabel’s life, with her angel sister invisibly on her shoulder. .-= catherine lucas´s last blog ..A Portugese church in California =-. Oh my gosh, Heather,,,,,,,,,,,what a day that was, but look at what it produced! Annie looks so much like her beautiful, big sister in this picture,,,,,,,her eyes, her nose, her mouth,,,,she really does have so much of Maddie in her! She looks absolutely adorable in her little heart outfit! I just want to snuggle that baby! She is precious. And man, is she a Mini Mike or what? It always makes me giggle. .-= Amy´s last blog ..Flowing with Energy =-. We can see how special she is. Amazing story – thank you for sharing with us. Your girls are astoundingly beautiful. Like their mother and father. Wishing you a lifetime of love and joy in your Annie. She is the most adorable baby!!! I’m so happy for you guys!!! Beautiful story and a beautiful baby (love that bottom picture). .-= Jill´s last blog ..A poem for the Teenager =-. She is breathtakingly beautiful. Just like her sister. I could not be happier for all of you. What an angel. Annie is so lucky to have you documenting all these special moments in her life. That story was heartwrenching and breathtaking. I read that post about the baby maybe being born today – I have to say I was glued to my computer and let out a shreik of joy long with more than a few happy tears when I read the post about her arrival. I was sooooo happy for you guys. What amazing pictures, thanks for sharing them with us. Annie and Maddie are both very special girls, in more ways then you can even imagine, they’ve taught me so much about life. Praying for Maddie and for your continued happiness with your new bundle of joy. She is a precious angel. A beautiful picture of miss Annie. She does look so much like her big sister. Thank you for sharing Annie’s birth day with us. I don’t remember much from my daughter’s birth (emergency c-section @ 27 wks), but I am hoping to remember this one next month. I am so glad you got to have a happy joyful “birth” day for Annie! .-= Lindsay´s last blog ..See You in 2 Weeks Or… =-. II’m glad even with all of the overwhelming feelings you’re having you werre able to remember and express Annie’s birth. My favourite all tie picture was the one where you are reaching out for that first touch. A moment like that is so magical, profound, awesome and nothing less then a miracle!! Yours is the only blog I have ever respomed too. I think of you often and pray for your peace and happiness ever day. I know this is a difficult time Heather but I just wanted to remind you….you, even in your darkest hours….are NEVER alone. I have to say, with every new picture that you post- she looks more and more like her big sister! And that onesie is outrageously adorable, also, might I add! Congrats again on your beautiful angel! She’s just perfect and I wish you nothing but love and happiness as you watch her grow!! awesome! So sweet. I’m so happy that you were able to share this with us. What a beautiful little girl. I think this post conveys just how special she is. .-= Kristin´s last blog ..SHOW AND TELL: Gabe Tells A Joke =-. Don’t worry, she knows. (((Hugs))) from here! .-= jen´s last blog ..really =-. So beautiful…the story and the baby. .-= Angie´s last blog ..What’s Gonna Work? =-. That first momen when they put your baby on your chest is magical, incredible, overwhelming. The look in your eyes as you gaze down at Annabel just says everything in the world. .-= Mary´s last blog ..Gone =-. She is so beautiful. I don’t think words can express how beautiful she is. And I agree with a comment above…. I think she realizes it too. .-= Ari´s last blog ..New camera bag: Lola by epiphanie =-. I agree, she totally looks like Mike in this one. And I think Annie will know just how special she is without you coming up with a great way to show her. Because you are showing her with all of this. And with how treasured she has been the entire 9 ish months while she was getting ready to arrive. glad it was a happy day for you. Thinking of you always. Annie knows how special she is with every look, touch and hug from Mom and Dad. She and Maddie are so beautifully blessed to have such great parents. Thanks again for sharing your lives with us. Annabel is just BEAUTIFUL…the picture in the hearts onesie is just too cute for words. Heather, you look prettier in surgery that I do when I’m on a date with my husband! Oh my gosh, Annabel — what a little bundle of sweet! I wish I could just pick her right up off of the page. Congratulations. She’s a true beauty. Tears are flowing. It is so easy to see, through your words, just how special Annie is to you and Mike. She is one lucky and loved little girl. Thank you for sharing your version of the story. I can’t imagine all the emotions you must have been going through. I’m glad you ended up being able to be awake for Annie’s birth and could hear that first precious cry, there is nothing like that first one. Annie is just so adorable. Love the pic. Heather, she’s so perfect. She’s just amazing. And what a lovely birthday she had. .-= Aunt Becky´s last blog ..Because Not Everyone Can Be A Ballerina =-. I’m so glad you guys got your happy ending! .-= Andria Stanley´s last blog ..Day In The Life Of =-. She is absolutly beautiful. Thank you for sharing her story. Your words are so powerful, but your photos – wow, they blow me away. The first pic, where you are reaching out to your baby, the joy in your face, had me crying with happiness for you! And I kept crying as I read that Madeline was included in Annabel’s birth day, I am so happy for you and Mike about that. Also, loving that Valentine photo of your precious Annie! .-= MommaLionessMichele´s last blog ..Me & My Mac: We’re Ba-ack! =-. Wonderful birth story! Thank you for sharing it with all of us. I see alot of Maddie in the picture of Annie with the hearts on her onesie. Maddie wants you all to be happy, I hope you have many more joyful days ahead. What a beautiful story…so glad you were able to get the days events recorded. Annie will soon be asking about the day she was born, and now you will have everything saved for her. I love that photo with the heart outfit! Such a cutie!!! I honestly don’t know how you stayed calm through most of that, because I’m sure that I wouldn’t have been able to. As always, I bow down to your awesomeness. You sure do make some beautiful babies. Something tells me that Annabel will ALWAYS know how special she is. .-= cindy w´s last blog ..a little toddler romance =-. Even though I don’t know you personally and even though I know you and Annabel are OK and came through it all with flying colors, when I read Mike’s post and reading what you wrote here about how you lost consciousness gets me right in the gut. Thank goodness for the way things turned out! And it does sound like the happy and joyous day it was. She wouldn’t need to read it to know, but when Annabel one day reads your blog, she will never have a doubt about how loved and treasured she was even before she was born. She knows how beloved she is already, but it is documented beautifully in yours and Mike’s words and the photos. .. And I am very happy that your friend was there too and that everyone included memories of Maddie at Annabel’s birth. What a special day for a special little girl. She is beautiful. Dammit woman, you made me cry at work AGAIN. In all seriousness, I am so happy for you and your family. She is just precious. Just precious. Amazingly beautiful baby, equally amazing parents! Reading all you and Mike have already written about your amazing Annabel clearly conveys just how special your second daughter is to you both. Reading your post today has brought tears to my eyes as I think of all you went through with the birth and then as you touched your girl for the first time. Your words are, as always, so beautifully written. So many people all over the world celebrated with you and Mike on the wonderful day Annie came into the world and we continue to celebrate with you on your journey as parents. Of course we all remember your first daughter dearly too. 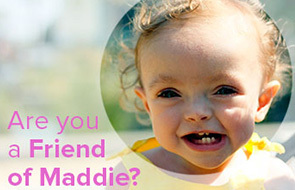 Your World Famous Maddie made her mark on this world, just as her sister will too. Its no surprise as they have such amazing parents. Heather, you and Mike are such inspirations. Thinking of you all every day. That first picture of you seeing Annabel is perfection! .-= Megan @ Mama Bub´s last blog ..My Funny Valentine: The Best Laid Plans =-. something to aspire to every day!!! .-= Jen the Catalyst´s last blog ..Thanks to my little sis =-. I don’t know how you get anything done at all! I wouldn’t be able to put her down for a second! Have you been able to communicate with Annisa or send pics? I know she’s doing better and has been moved to a Rehab facility. I can’t wait for the reunion pics of all of you and to see her with Annie! :) Much love, hugs and blessings to you all! OMG she is sooooooo beautiful, cute, precious and as doll! Thanks for sharing your story once again. I think you should write a book! What a story. And such emotion. I’m glad you were able to concentrate on Annie’s birth that day, and be awake for it, and include Maddie in all of the joy. .-= Mary @ Holy Mackerel´s last blog ..The List, Or How To Do Toronto Real Good With Lots And Lots Of Puke and Poop =-. What a beautiful birth story! And I see in the recent picture of your lovely girl, Rigby close behind her. Rigby, the ever faithful guard dog! You and Mike and your families, definitely deserve this joy. Maddie is looking down from above and she is very happy too, after all, God and Maddie planned all this! I have been following your site for over a year, but have never posted. Just want you to know that you have another supporter out here! I cried when I saw your very first picture of Annabel – so very, very happy for your family. Congratulations on welcoming your sweet Annabel! .-= Karen´s last blog ..Great Park, Great Day! =-. you have been sharing how special she is since the day you announced you were pregnant with Binky. There is no doubt in my mind (or anyone else’s) how special she is to you and your family. Thank you for sharing your story. It brings such emotion to me my heart each and every day. .-= robin´s last blog ..shoelaces =-. My guess is that it’s a lifelong struggle to find the words that adequately describe how special our babies are. And I think writing a great blog 27 DAYS after your child’s birth is a sign that you are expressing yourself quite well. .-= Greta Koenigin´s last blog ..My Olympic Dream =-. She is adorable! congrats on her, and I think she looks a bit like Mike! wow! emotions aplenty; i can only imagine. I re-read the last paragraph and was so happy for you, so happy the joy was shining through all the pain of 2009. the best just might be yet to come! .-= leel´s last blog ..a little art 411 =-. I’ve been reading for so long I almost don’t cry (much) anymore, but this post… I don’t know. It might be among your most beautiful ever. Your daughter Annabel is as amazing as her sister, and it is no real surprise, coming from extraordinary people like you & Mike; people whose love for their children and each other inspires me. It is amazing to me that even when I read someones birth story, it brings me back to my own 5 and a half months ago. I have been reading your blog only a a month or so. But I have read everyone of them. My heart has ached, smiled, and laughed reading your blog. I love looking at the pictures and videos of Maddie and Annabel. You are truly amazing parents, the love you have for your girls brings tears to my eyes. As wonderful a writer as you are, I am not sure that there ARE words to express just how special, wonderful, loved, amazing, and beautiful Annie is. But she’ll know that’s how you feel about her. She’ll definitely know. Your emotions must be exhausted by now. Experiencing a death and a difficult pregnancy and a birth all in the same year. It’s no wonder you had a hard time writing about such an emotional experience. Hugs to you all and keep the pictures coming because that last one? Is so cute I can hardly stand it. I don’t think there are ever enough words to explain just how special our babies are to us! She is exquisite!! .-= Michelle Pixie´s last blog ..Lost Without You =-. The picture tells the story without words! .-= Pamela @ 2 Much Testosterone´s last blog ..Writer’s Workshop – A Picture Story (there might be talk of placenta involved!) =-. Adore that picture of Annie. Breath taking. .-= Issa´s last blog ..Two Valium and a bottle of wine… =-. The picture of your first glance of Annie is priceless. I’m so happy for you and Mike. Abundant blessings over all of you as you negotiate the dips and swirls and flow of this river of life you are on. Thank you for sharing your lives with us all. I can only imagine all the feelings that are rushing over you and Mike then and now. Annie is absolutely precious and is it just me, or do those little legs look just like Maddie’s?? It’s crazy how much she resembles Maddie. .-= Jenn´s last blog ..Gracie goes back to preschool =-. Your baby is just so beautiful! A clone of her dad! You look just radiant in that first picture. Annabel is so gorgeous and such a gift. I’m so glad you have her. .-= Rumour Miller´s last blog ..The One with all the contractions =-. Some scary moments…I am so glad you were able to be awake with Mike when you heard her first precious, wonderful cries! .-= Jodee´s last blog ..Honest Blogging =-. I’m so, so glad that everyone included Madeline in the day that Annie was born. Such a dramatic story, and I think Annie will enjoy reading it one day when she is older. I think everytime you post, you find the words you are searching for to tell Annie how special she is…I see it all through your writing! What a gorgeous lil girl she is! I’m so happy for you & Mike and your extended family and friends. Annie is a gift of joy. I’m sure Maddie is looking down loving it all! .-= Mary´s last blog ..Perspective Check…updated =-. What a beautiful little girl she is. Just like her sister and mom! I am so happy that you could enjoy that day as is meant to be! .-= Danielle´s last blog ..Rabid Pit Bull or Something Else? =-. Good afternoon. You have already expressed the words to just how special Annie is. We all know how you, and most importantly Annie knows. You are a wonderful mother, trust in that. she’s so beautiful just like her big sister. I think I already said this, but she looks just like Mike! She is adorable. I’m so glad her birth day was full of happiness for you. You deserve it! .-= Christy´s last blog ..Did I forget to mention? =-. I usually don’t see how new babies look like anyone, but I really think she looks like Mike!!! So fun huh? My daughter is 2 months old now. Enjoy that newest of stages! Thanks for sharing Annie’s birth story! She’s amazingly beautiful just like you and Maddie. .-= Anne DiNapoli´s last blog ..Time for TV =-. You are the bravest woman in the world and I love you so much. .-= wordygirl´s last blog ..Me Time =-. .-= Karen´s last blog ..Bless me Father, for I have sinned… =-. So beautiful!!!!!!! I LOVE THE SPOHRS. Aawww she is so sweet and precious. What a lovely photo. I so wish I lived close enough and you actually KNEW me so I could hold her and snuggle for awhile…..she looks like a sweet little snuggle bunny! .-= Rebecca´s last blog ..Maggiano’s Reservations =-. Actually, no words needed- it’s obvious. Annie is just so little and precious! I love seeing pictures. .-= Lisa @ lists in my pocket´s last blog ..On My Nightstand/Prayer Request =-. She is such a doll…just beautiful. Like her parents and of course her beautiful big sister. .-= Nichol´s last blog ..Math Tips to Celebrate the DVD Release of LeapFrog: Math Adventure to the Moon! =-. SO glad you don’t have to remember that scary moment…and so happy for you and Mike and your beautiful Annie. .-= Dawn´s last blog ..Mug Shots =-. What an amazing picture! She’s such a beauty. .-= MstoMrs´s last blog ..Its been a while… =-. Bless you all and that sweet, adorable lil peanut! She is already going bald…rogain for babies???? I am so glad to hear that your birth, while a crazy ride was a joyous and happy event. I have wondered as a mother how you would feel and guessed you would feel so overly joyful to feel a strong healthy baby and I am sure you will have some days where there will be more sad moments….but I am thrilled that this day was Annabels! And she just looks adorable in her little hearts outfit! I love it! You already have found the words. Over and over. Beautiful, magical words. They will keep pouring out of you because you are—-amazing. Oh wait, I’ve told you that a thousand times. I gotta come up with something new. You are simply gifted. And beautiful. I swear, you were put in this world to be their mother and to tell this story. I’ll work on the superlatives, but you defy words. heartfelt congratulations on the birth of Annabel, may she grace your life with the same joy as Madeline did. Hearing that first newborn cry after losing a child is one of the best things in life ever. .-= Trish´s last blog ..Wednesday =-. Thank you for sharing Maddie and Annabel with us! She is so sweet. Congratulations to the both of you . .-= Maria @BOREDmommy´s last blog ..Best. Commercial. Ever. =-. She is SO special. And so beautiful. And so loved. Congratulations. .-= Alicia @bethsix´s last blog ..I Always Liked Silver Better Anyway =-. .-= Haley´s last blog ..New Look =-. I am just overcome with joy for you all! All a tingle and a shivering as I read!!! HUGS TO YOU ALL!!!!! .-= Janice (5 Minutes for Mom)´s last blog ..Our Lucky Winners for February 20th =-. (A baby can breathe quite fine without ever crying at birth, but I can understand your connection between the two). .-= TracyKM´s last blog .."To Save Time…" =-. I only want the best for you, to see you have some well deserved happiness. Annie is so gorgeous, I know every time you look at her you are nothing but happy, that’s a comfort to me, I hate to think about you and Mike having to be in the darkness that comes with losing a child, even though I know it has to happen at times. I am just so glad you have this beautiful girl to help take you to a great place! Happy birthday, little one! Congratulations! .-= Two Makes Four´s last blog ..Something Beyond Pepto =-. Amazing! What a beautiful day it was! She looks SO MUCH like Mike in that last photo!! I am SO very sad that you lost your Maddie. And I am SO very glad that you found your Annie. I’m so sad about your loss. I’m so grateful for your find. And I think Maddie would be….too. You and your husband are such strong, amazing people. I LOVE all the pictures of Annabel, she’s just breathtakingly beautiful. You know that Maddie is looking down and smiling. You two are a true inspiration to so many people. Keep up the pictures and again congrats on such a gorgeous babygirl. Awwww. SO darling. I’m so glad that Annie’s birth day was full of joy.